The agriculture industry has increasingly embraced solar as a way of combating rising electricity costs. From almond processors to mushroom growers and wineries, more food and beverage companies are going solar to improve their bottom line while doing something that’s good for the environment. Ag relies on electricity for crucial tasks from pumping water to powering cold food storage. With ag electricity costs more than doubling from 2007 to 2012, according to the most recently published Census of Agriculture, the industry has turned to renewable energy sources. For example, the number of farm operations producing on-farm renewable energy doubled between 2008 and 2011, according to a U.S. Department of Agriculture report. At the family owned Du-Brook Dairy in Casa Grande, Ariz., a SunPower® solar power system designed and installed by Sun Valley Solar Solutions has reduced the dairy’s reliance on purchased utility grid power by as much as 50 percent, saving up to $2,200 a month in the summer. It is projected that the business will save nearly $520,000 over the next 20 years. Dairies use massive amounts of electricity from critical technology such as climate control systems, milking machines and refrigerators. As part of its services, Sun Valley Solar helped the dairy secure a U.S. Department of Agriculture Rural Energy for America (REAP) grant, which is in place to assist agricultural producers with renewable energy investments. It covered 25 percent of the cost of the system. With an additional 30 percent federal tax credit (learn about the Investment Tax Credit in this infographic) and a 10 percent credit from the Arizona Commerce Authority, adding solar began to look like more than a wise investment – it was a smart business strategy, too. Sun Valley Solar designed and installed the solar power system on rooftops and custom shade structures at the dairy, which houses more than 2,000 head of cattle. 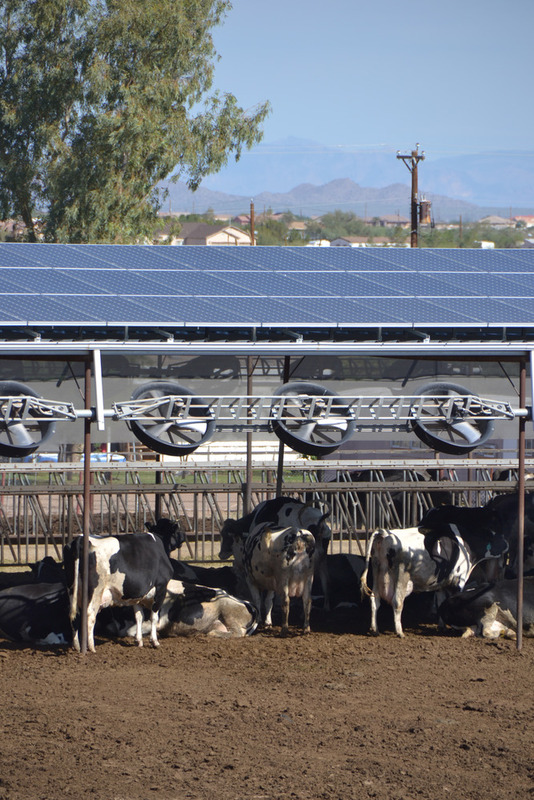 The shade structures, similar to carport solar systems that SunPower installs for its school, university and corporate customers, help keep cows cool during Arizona’s hot summer months. Dairy owner Pat Dugan was happy with the speed of the installation process and with the workmanship displayed with the project. “The whole thing went up really fast with virtually no disruption to our operations,” Dugan told us. Du-Brook Dairy’s new solar photovoltaic system is making them more energy independent and saving them money. SunPower is a proud sponsor of the 50th Annual World Ag Expo, taking place Feb. 13 through Feb. 16 in Tulare, Ca. Enjoy food and drinks on us at the exhibitor reception, 4-7 p.m. Monday at the arena. On Tuesday our Western Area Sales Manager Daryl Franks will talk about Solar and Water: How to Reduce Your Operating Costs from 10-11 a.m. at the Seminar Center, Trailer 1. (Click here to read Franks' recent blog about solar and water.) Make sure to visit one of seven SunPower dealers there to learn more about how solar can help your business. Visit the SunPower agriculture page to learn more about solar for agriculture. Subscribe to the SunPower Business Feed to learn more about how commercial solar works.